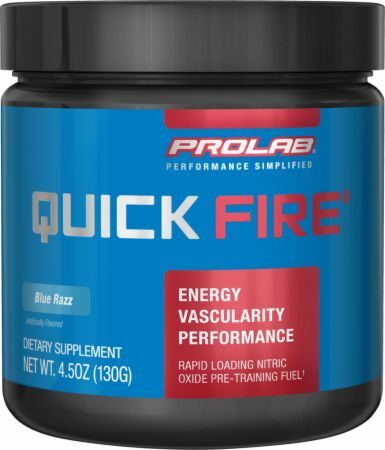 Quick Fire, the Prolab pre-workout is an essential way to go and ensure that one gets the energy that they need to successfully complete a strenuous session. One of the key problems that becomes evident after having a intense workout comes in the desire to get back into the gym. You may be able to have a set of personal records shattered during a Monday workout but then it becomes difficult to go back and pound out a cardio or legs day 24 hours later. Pre workouts are solid sorts of supplements in that they give the boost that is necessary to first get individuals out to the gym and for these fitness buffs to give their all for a follow-up work out. Quick Fire contains a fair amount of caffeine and other energy providing inclusions while not allowing one to become jittery or otherwise sub-optimal with their form. The effects of Quick Fire will last beyond the hour hour-and-a-half that one stays at the gym giving a fair amount of energy for the next 2 or 3 hours after one completes their session. Check out a wonderful resource. The miscibility of Quick Fire and such that one can place a scoop in their favorite shaker or bottle of water and after a few seconds of vigorous shaking can have a consistent beverage without chunkiness or variation in terms of the flavoring. Pro lab’s blue razz flavor of Quick Fire makes for a pretty tasty sort of beverage all things considered; one can imagine that it is an amped up version of the juices that one and have what they were a kid. We have had good experiences with Prolab products in the past; check out our coverage of their Advanced Caffeine Supplement and Amino Gel-Caps .